StitchBuddy can view, modify and convert embroidery files. Parts of a design can be flipped or rotated, moved or deleted. Multiple designs can be combined and thread colors can be changed. You can assign different hoops and thread charts, and you can print designs and templates - for single files or creating catalogs of multiple designs. 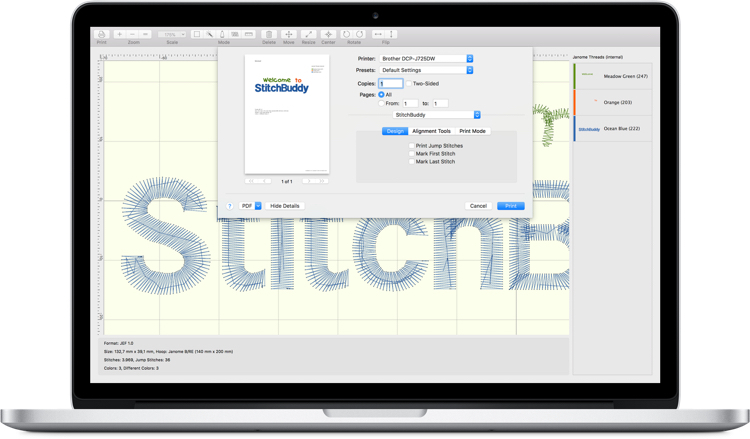 StitchBuddy is available in two versions, running on Apple computers, iPhones and iPads. Because they share the same core, feature sets are very similar, but there are some differences. Be sure to check the feature overview for more details.